I saw that Jlev made a new company a bit ago but I just looked at their website and it actually offers stuff now. 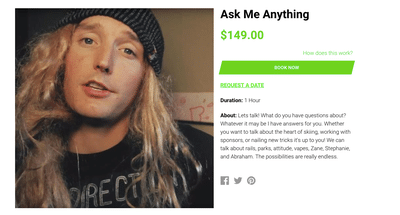 What do you guys think about his idea (paying to consult or ride with pros)? I agree with you 100%. I didn't understand how cheap the offers were until I realized that most places charge comparable amounts for some random instructor. Pay 500$ to lean from Breck Mountain school or ski backcountry with Giray dadali....ya know? steve stept is listed as a pro??? jlev just keeps killing it. This is a dope idea and way bigger than skiing, will be interesting to see where this goes. I just logged on to post about this cause I saw it on IG. But I definitely think it's dope, and would love to ski with some of the guys they got on there. But a day with a pro cost literally more than my ikon pass, and thats kinda hard to justify tbh. The custom ski making class seems pretty cool. Thanks for the stoke everyone! I've been brewing on this idea for a long time, over the years seeing so many pros skiers with amazing skills, knowledge and a huge number of fans leave the sport "professionally" because they just can't make ends meet, with no efficient way to monetize their real value. Currently the only way for them to barely make a living is to beg a sponsor to pay them for risking their lives trying to win a comp. I'm hoping this platform can empower pros & experts, in all industries, to cut out the middle man and go directly to their fans offering to share their knowledge and one-of-a-kind experiences to help them finance doing what we all love seeing them do! This isn't a new idea, it's an "Experience" based platform enabling people to sell an experience to others. Airbnb currently offers thousands of experiences by everyday people (visit this town and go on a bike ride with a local, etc.). This platform Rollwithapro.com is different by focusing specifically on enabling pros, experts, celebrities, etc to offer experiences. I'm started this in skiing because this is the sport I know best, but we're quickly adding more pros daily from all industries and disciplines. 3) You pay by booking the experience, when the day comes, you meet up with the pro and have a one of a kind experience! Hit me up anytime with any questions and thanks for helping spread the word! This is actually dope AF. It would be sweet to get a crew together and roll around Snowbird with Thayne Rich then drink at the 4FRNT HQ. You should get more amateur filmakers and photographers on the site too for anyone that wants to have someone to ski with and get shots from the day. SuspiciousFish This is actually dope AF. It would be sweet to get a crew together and roll around Snowbird with Thayne Rich then drink at the 4FRNT HQ. How much for this experience?